1. Old batting stars look, well, old: The IPL tourney included a handful of players who have been out of international cricket for a while and are not even playing domestic cricket. Case in point: Adam Gilchrist, Mathew Hayden, Damien Martyn, Sanath Jayasuriya. Both Gilly and Haydos at least had couple of shining moments, but Marto was utterly disappointing. Wonder Warne took him in his team just for ol’ time’s sake! The exception to this rule was Sourav “Dada” Ganguly. He kept getting better as the tournament wore on and even his fielding and catching was unlike what we have seen before from him. Perhaps, he had a point to prove and wanted to show his team of underachievers how its done. The old “bowling” stars still reigned supreme. Anil Kumble and Shane Warne were beyond belief. Simply superb! 2. Sachin Tendulkar has mastered another format of the game: This shouldn’t come as a surprise to anyone. 2008 season was injury-plagued for Sachin and 2009 was so-so. As we saw from him in 2009-10 international fixtures, he has found the fountain of youth. He quite easily became the leading run getter of the league stage. He never resorted to ugly slogs like VVS did and showed everyone he is in a class all by himself. He also showed his true grit by playing the final match even with 5 stitches in his hand. Take bow, Master! 3. Sreesanth is like a dog’s tail – Cannot be straightened out: After the slap-gate incident, the new and improved, and seemingly contrite and looking to be under control Sreesanth vowed that the days of acting like a petulant teenager are long gone. But, that behavior reared its ugly head yet again this year! From mocking the batsman who just hit him for a four, to sarcastically applauding the umpire who called him for no balls, Sreesanth was well and truly, back to his own child self. Its a crying shame that a talent like him is getting lost in all the hoopla and hype that is Indian Cricket. There are very few bowlers that can swing the ball away from the righthander at such good pace like him but he needs to screw his head back on straight, pronto! The proverbial rope he may get with the administrators and fans of Indian cricket is fast running short. 4. Kolkata Knight Riders are not the most dysfunctional team: That title, at least for 2010, goes to the Kings XI Punjab. The captaincy was taken away from their icon player, Yuvraj Singh, during the off-season, and given to Kumar Sangakkara, which led to news/rumors that Yuvi is extremely unhappy with the Kings XI set up and wanted to move to Mumbai. Though these reports were laid to rest by the team management and Yuvi himself, he didn’t seem to be clicking on all cylinders for his team. It seemed like he was not very interested. This team was the most up and down team of the league. They lost matches they should have won walking away! When their batting clicked, their bowling was abysmal and vice versa. After the early days experiment with Bopara up top, Sangakkara brought Mahela Jayawardene in as the opener and he served his captain well. 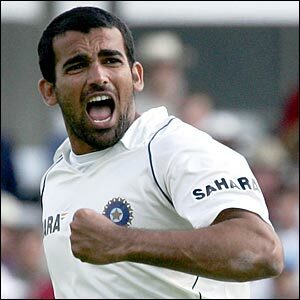 Irfan Pathan looks a shell of himself. The guy is a lasting evidence of the effect Greg Chappell has left on Indian Cricket. The local indian domestic players did not contribute much to the team’s success, which segues nicely in to the next item on the list. Did I mention Sreesanth is part of Kings XI? ‘nough said. 5. You win with domestic players: Since 7 of the 11 players in a team are Indians and quite possibly, 5 of those 7 do not have international experience and are not big name stars, a team can win consistently if these 5 players can step up to the plate from time to time and contribute to the team’s cause, as bowlers or batsmen. Mumbai showed the blueprint for this. The Indian duo of Ambati Rayadu and Saurabh Tiwary held the Mumbai’s middle order together. They played a cautious game when the chips were down and drove home the advantage when the openers gave them a platform. The Deccan Chargers benefitted from the bats of Monish Mishra and more significantly, Tirumalasetti Suman. Even the Chennai Super Kings solved their opening bowling blues by having the local talent R. Ashwin to bowl off-spin with the new ball. The Kolkata Knight Riders suffered most acutely from the lack of performance by the local talent. 6. Indian pace bowling stock is threadbare: Besides Zaheer Khan, there were no noteworthy and consistent performances by Indian pace bowlers. The two (medium) pacers from the Royal Challengers Praveen Kumar and Vinay Kumar benefitted tremendously by bowling alongside Dale Steyn and the miserly wizard, Anil Kumble. The batsmen had to take the chances against these two bowlers (PK and VK) and hence, these 2 got a bucket load of wickets. For the sake of fairness, PK bowled well with the new ball but as it got older, his lack of pace became painfully obvious. Some of the names that were on everyone’s lips the past 2-3 years, Ishant Sharma, RP Singh, VRV Singh, Sreesanth etc., were extremely disappointing. The young lad, Umesh Yadav, from Delhi Daredevils looks like a promising fast bowler. Ashish Nehra is still too inconsistent for my liking. 7. I Can’t figure out the Delhi Daredevils: This batting lineup boasted a cavalcade of stars: David Warner, Virender Sehwag, Dilshan, Gautam Gambhir, AB De Villiers, Dinesh Karthik (and towards the end, Paul Collingwood). Their bowling was nothing to sneeze at either with Dirk Nannes, Amit Mishra, Sangwan, Nehra. Yet, they did not even qualify for the semifinals. Gambhir seemed to be a capable captain and put the responsibility on himself to bailout the team in tight situations, such as the match against CSK in that electric oven in Chennai. They were surely put back in some key games by top order collapses. Too many batsmen in the same mold? Perhaps.